I scream, you scream, BUT I scream LOUDER because I HAVE COFFEE ICE CREAM! Sitting at the kitchen table at 4:45 p.m. on this lovely early April afternoon, I’m listening to the sounds of happy birds chirping outside and keep catching glimpses of sun-rays peeking through the gray clouds that have threatened – and NOT delivered – rain for days and days… I watered my kitchen garden a few minutes ago. Pulled some weeds. Flung a few snails – the devil’s own henchmen – across the yard into the wooden fence as hard as I could. So far, they haven’t been able to destroy my leafy greens in the Salad Garden zone. The unnaturally strange and kooky mix of “Hips Don’t Lie + Pop Goes the Weasel + The Mexican Hat Dance” … it gets in my head and I can’t help but sing along. I curse the Ice Cream Man and sing along with his creepy music. Yeesh. I heard the sound of the all-powerful music yesterday – Easter Sunday – in the late afternoon. I used every bit of energy I had to ignore the hypnotic tune. In all honesty, there’s very little I will buy from the ice cream truck. I like paletas, because DUH, I live by San Antonio, and Blue Bell’s Coconut bars, because DUH, Blue Bell’s the best ice cream in the country. Since the only thing I would’ve gotten from the ice cream truck yesterday was the frozen coconut treat, and considering that Blue Bell is having some problems with contamination right now, I was able to stay put inside without being drawn outside. And, then, I made my OWN ice cream. I wish I could show you pictures of the ingredients and give you detailed step-by-step images to hold your hand through the process of making homemade ice cream, but I can’t. Not only did I NOT take pictures, it all happened SO QUICKLY that the Ice Cream Man was probably still making his way around our little neighborhood when I put my finished pan of creamy deliciousness in the freezer. It came together SO FAST, and so easily… and it is soooooooo gooooooooood. 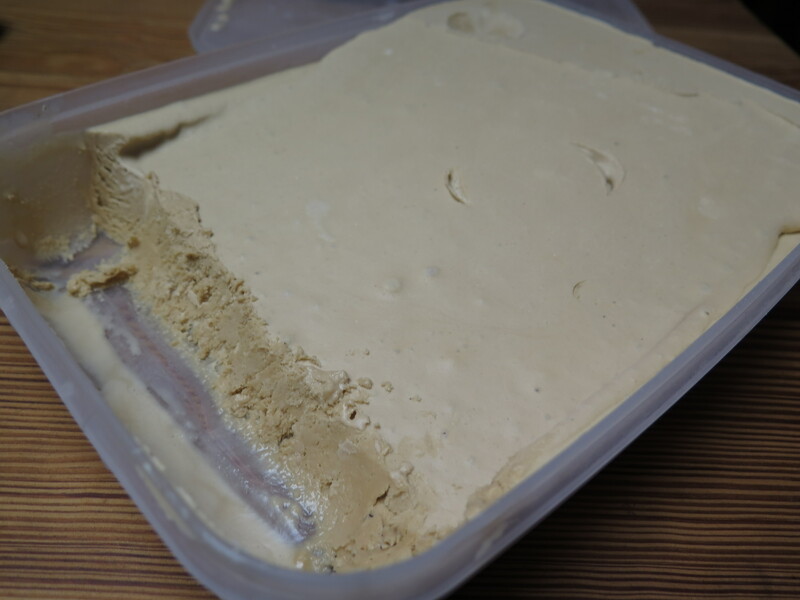 I made coffee ice cream. I love coffee. I try to quit coffee every once in a while, but coffee pulls me back in with just one whiff of one little bean. I.CAN’T.QUIT.COFFEE. 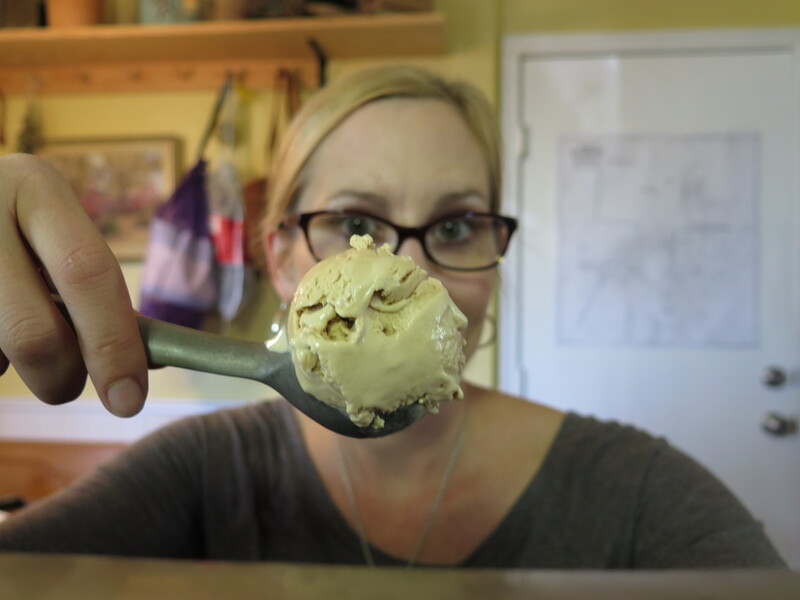 So why wouldn’t I make coffee ice cream? Get a mixing bowl. Pour in your little packets of coffee. Add enough water to dissolve it completely… or if you have a Keurig or access to a little bit of coffee, brew a strong 4-ouncer to mix in. It’s not rocket science, and four ounces wasn’t too much liquid. Coffee is good – more coffee is gooder. Can you hear my heart beating right now? It sounds really loud. Coffee. COFFEE. Okay, next up… pour in that sweetened condensed milk. Carefully lick the lid because you can’t waste any of that precious sweet stuff. Just kidding, you don’t have to do it like I do. Pour in the whipping cream. Now, using your electric mixer – because at this point you haven’t had enough caffeine and sugar infused into your system to give you the strength and energy to mix it by hand with a whisk – just beat it until things start to thicken up. Not too thick – we’re not making butter – but thick. I wish I had taken pictures. Oh well. Seriously, this is hard to screw up. 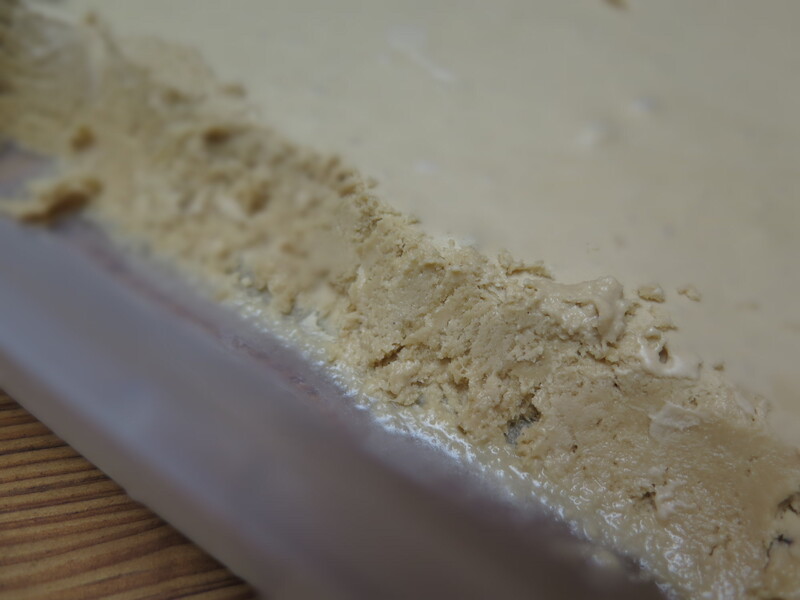 Once it’s thick-ish, transfer it to a freezable container and stick it in the freezer. I have some really nice 1.75L (or 7.4-cup or 15 scant-half-cup – you decide which measurement you’d like to use) rectangular-shaped toxin-free plastic containers from the Container Store that are perfect for stacking in the fridge and freezer. Tomorrow, I’m making coconut ice cream. And shopping for bigger pants… for today, we eat COFFEE ICE CREAM! If you don’t put your pan in the freezer straight, you won’t get a pan of straight ice cream. See? BUT it’s so very delicious and I’ll be scraping the edges clean anyway!!! I’m really trying to imagine what the “unnaturally strange and kooky mix of “Hips Don’t Lie + Pop Goes the Weasel + The Mexican Hat Dance” sounds like. He seems to be a clever ice cream man touching all genres of music to tempt the soul. Except, he doesn’t even know his supply can’t even compare to what you got going on. Now I’m wanting some homeade COFFEE ice cream!!! I do not miss that ice cream truck…post the coconut directions I have given up caffeine (I know I could use decaf) but I love me some coconut! Previous Previous post: Who CARES what it’s called. It’s easy and delicious. Next Next post: Short and sweet… I’ve got cookies to eat.